ST. GEORGE – Negotiations between state and federal officials began Monday at the Dixie Center St. George looking to give Utah access to water from Lake Powell in exchange for some of its existing access to Colorado River water via the Green River in Wyoming. The purpose of the exchange is to allow Utah the ability to draw water directly from Lake Powell for the Lake Powell Pipeline rather than drawing it from the Green River below the Flaming Gorge Dam. Utah already holds water rights to Colorado River water under the Colorado River Compact, specifically to 23 percent of the available water supply in the upper basin, Karry Rathje, spokeswoman for the Washington County Water Conservancy District, said. This equates to a yield of approximately 1.4 million acre-feet annually. The proposed exchange has to do with the use of federal water facilities, Glen Canyon Dam rather than Flaming Gorge Dam, necessary to drawing the water. “The state is proposing forbearing its use up on the Green River and its tributaries and allowing that water to flow down to Lake Powell where the state would pull it out for the Lake Powell Pipeline once that’s done,” said Marlon Duke, public affairs officer for the Bureau of Reclamation’s Salt Lake City office. 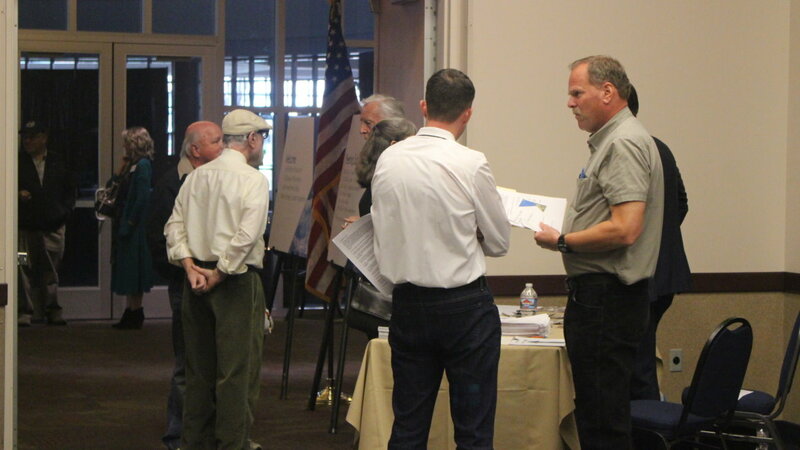 Representatives of the U.S. Bureau of Reclamation, Utah Division of Water Resources and Washington County Water Conservancy District were gathered at the Dixie Center for the first of a series of meetings focused on hashing out what they called a water exchange contract. Additional meetings are slated to to be held in Salt Lake City. “This negotiation is where we’ll sit down and talk about the details of what that exchange would look like,” Duke said. Utah currently maintains rights to use nearly 159,000 acre-feet of water from the Green River under the Colorado River Compact, water that is not currently being utilized. The proposed contract would allow Utah to instead draw 86,249 acre-feet of that allotment from Lake Powell – which has the capacity to store 26.2 million acre-feet of water released through Glen Canyon Dam – for the proposed pipeline. Basically the state is negotiating with the Bureau of Reclamation to allow it to draw water it already has rights to at a new location. It is not a transfer or purchase of water rights. Water released through the Flaming Gorge Dam flows into the Green River, down 400 miles of the Colorado River before reaching Lake Powell. While supplying water for the pipeline, releasing the water also has an environmental benefit to it, said Ron Thompson, general manager of Washington County Water Conservancy District. While the augmented river flows are touted as one of the benefits of the exchange, they also help provide a future water source for southwest Utah. Costs associated with the exchange were also a primary focus of Monday’s meeting. The Bureau of Reclamation proposed that Utah pay $19 per acre-foot of water for use of the Glen Canyon Dam facility annually. State officials were hoping for a lower rate of possibly between $10-to-$15, as the overall amount will ultimately factor into the price county residents may be paying for water in the future. The proposed $19 per acre-foot is nowhere near decided and may yet be reduced as both parties continue negotiations in subsequent meetings. 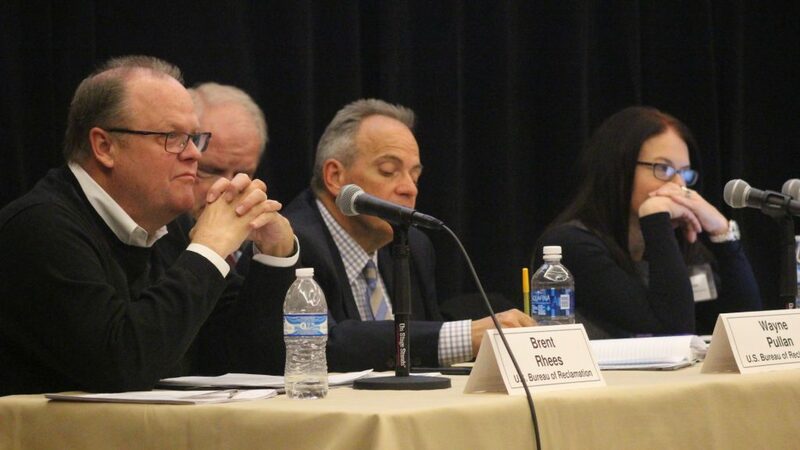 The cost is compensation to the United States for benefits Utah will receive from existing federal water facilities, Rathje said, again emphasizing that it is not a cost for the water itself. During a public comment period held during the meeting, a number of locally elected officials stood up and asked federal officials to consider keeping costs down so it wouldn’t have an adverse effect on Washington County residents. “In this situation I would ask that the United States government be very cautious about putting these rates too high,” Washington County Commissioner Zachary Renstrom said. Others who addressed federal officials included the mayors of St. George, Santa Clara and Ivins. Each expressed their long-standing support for the Lake Powell Pipeline project as a whole, for which the exchange would help lay the foundation. “Without the water rights being in a place you can take (the water) out, this project is meaningless,” Thompson said. Ever-increasing growth and a need to diversify Washington County’s water supply are given as reasons why the Lake Powell Pipeline is needed. “Every local city has a limited supply of water, most of which has been fully developed,” St. George Mayor Jon Pike said. The county’s current population is around 165,000 and is anticipated to reach 400,000 by 2060. State and county water officials don’t believe the Virgin River, the county’s only source of water, will be able to satisfy that increase – thus the need for the Lake Powell Pipeline. 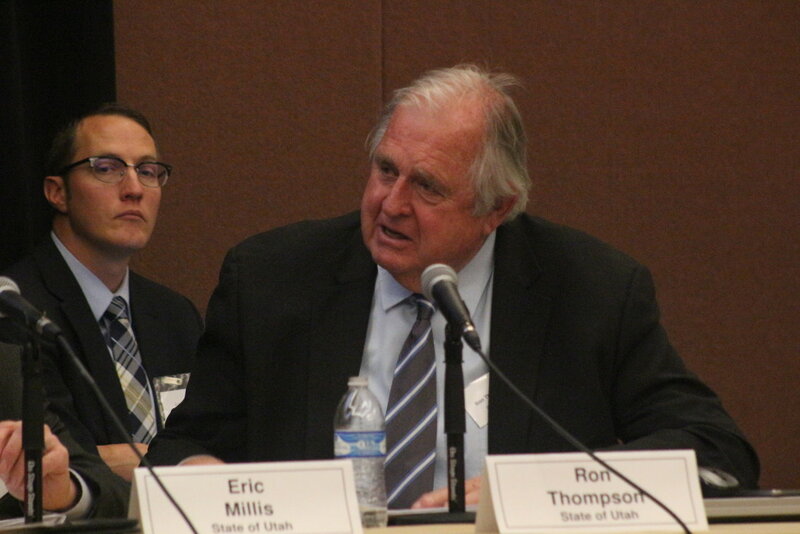 “This is the most reliable water source in Southern Utah that we can tap into,” Renstrom said. However, even with the pipeline, it will still be necessary to reduce water use, he said. Washington County and its municipalities have engaged in water conservation efforts, Pike said, with Washington County winning a challenge set by Gov. Gary Herbert to cut water use by 25 percent years ahead of a 2025 goal. Opponents of the Lake Powell Pipeline say it is not needed and that Washington County already has enough water to satisfy future growth needs. 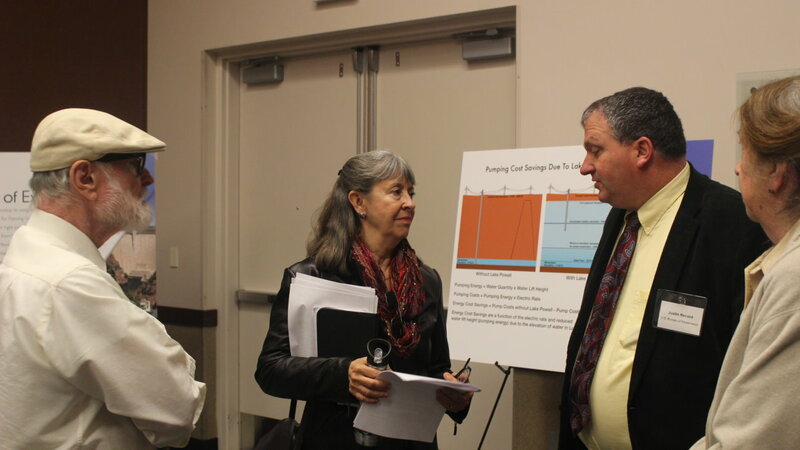 Rutherford said she has seen state and county water district studies that report current water resources can provide up to 98,000 acre-feet of water without the pipeline. Opponents of the pipeline also say that Washington County is one of the driest metropolitan areas in the country and one of the most water-wasteful. “We use far more water than other desert areas,” Rutherford said, adding that per-capita water consumption in Washington County is as high as 325 gallons per day. This a large amount when compared to other cities in the Southwest like Albuquerque, which is 127 gallons per capita daily. County water officials have long disputed residents actually use that much water. Rathje said that opponents of the pipeline are counting the overall water use within the county – which includes industrial and commercial uses along with residential use. The actual amount residents use, particularly in St. George which contains over half of the county’s population, is closer to 136 gallons per capita daily. Monday’s negotiations concluded without a resolution on the potential cost of water for the Lake Powell Pipeline, a topic for future meetings. Individuals who wish to offer feedback on the water exchange contract can email comments to UtahComments@usbr.gov. The Lake Powell Pipeline project proposes to bring over 86,000 acre-feet annually to Washington and Kane counties via a 140-mile long pipeline. The pipeline’s current proposed route has it snaking from Lake Powell to Sand Hollow Reservoir in Washington County. Helping to move the water along will be six hydroelectric power stations. The pipeline is anticipated to meet around half of Washington County’s water needs by 2060 when the population is projected to reach 400,000. Water conservation practices and additional development of current water resources will take care of the other half. 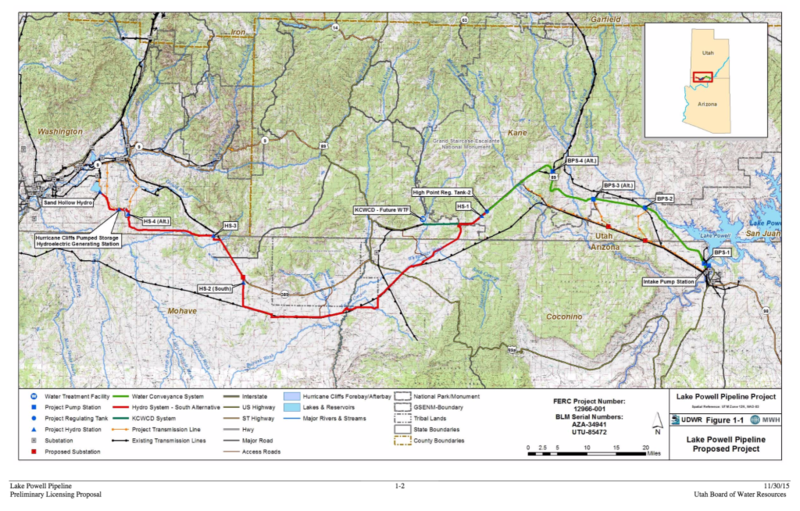 The pipeline proposal is currently being evaluated by the Federal Energy Regulatory Commission. It may soon initiate an environmental assessment study concerning the impacts the pipeline could have. If all goes well and the project is approved, Thompson said, construction on the Lake Powell Pipeline could begin in the 2020s. The water exchange contract between Utah and the Bureau of Reclamation would not be signed into effect until approval is given for the project. Current estimates place the cost of the pipeline between $1.2 billion and $1.8 billion, though that is subject to change depending on any changes made to the proposed project between now and its potential approval, county water officials have said. While the construction of the pipeline will be advanced by the state, it is anticipated repayment will be made through costs added to impact fees, water rates and property taxes within Washington County. Pipeline opponents warn that the cost of paying for the pipeline could be astronomical and cripple the future of the county with burdensome debt. Hey, what is that white ring around the lake? OR thus the need to keep the population of Utah’s Dixie at a level that won’t turn this into a big city and ruin the experience of living in this special place. If we don’t have enough water for it, we can’t become ugly urban sprawl with lots of newcomers who bring ideas that are not compatible with our community standards. We can maintain a special place for ourselves and our families. $1.2 to $1.8 Billion, with interest on top of that, and who is going to pay for that? You are. Each any everyone of you in Washington county will pay for this through massive property tax increases and monthly water bills so that the greed factory can continue to pump out housing and business for the every growing mass of humanity that they perpetuate….enjoy southern California living as it’s already getting to be gridlock here on the city roads and highways, yeah, let’s add another 300,000 residents. We can and should put a limit on growth per year….Boulder City Nevada does just that: In 1979, in response to the growth during that decade, the citizens approved a referendum and instituted a controlled growth ordinance. Due to this unique ordinance, the City limits the number of residential and hotel/motel building permits issued each year to control the rate of growth of the community. Ms. Rathje of the water district uses 136 residential use to justify the pipeline chiding opponents for including commercial, industrial and institutional usage to challenge the project. Why would anyone not consider the CII water in the numbers. It’s over half of our water usage. Our current overall usage by the state and district’s own numbers is around 325 gallons per capita per day. For Rathje and others in the water business to try and throw the public off by citing a number that leaves out the majority of the water used, and which is driving the “perceived” need for the LPP, does the public no favor and makes one wonder do they not know better themselves or is it just a ploy? If Rathje and others want to just use a residential-only number then lets look at other places in the desert Southwest where they use around 35-70 gpcd residential.